ELLEEBANA LASH LIFT DELIVERS LUSCIOUS, LIFTED LASHES THAT LAST UP TO 12 WEEKS, IN THE BLINK OF AN EYE. 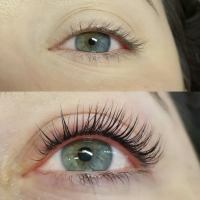 Just one 45 minute professional PARABEN FREE, FORMALDEHYDE FREE, and HARSH CHEMICAL FREE treatment is all it takes to get a sumptuous lash curl that is retained, even after showering or swimming. We will also always end your service with a complimentary Keratin boost to help seal and condition your lashes. Before your first visit for a lash lift or SPM, please print and complete this form. It's a lifting technique designed to give you longer-looking beautiful lashes without the need for lash extensions lasting 8 to 12 weeks! To top off the treatment, you'll also receive a lash tint making your lashes look even more prominent. Lash extensions and lash lifts are two very different applications. 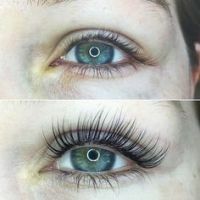 Lifts do not add any additional lashes. We will simply be curling and amplifying your natural lashes. If you desire longer, fuller lashes, we suggest that you try the lash lift, a tint, and a few months of our GrandeLash MD serum and see what you think. You will be thrilled with the results! And, you can even get a lash lift while wearing lash extensions! Please print and complete the form above. Please do not wear ANY eye makeup the day of your appointment. If you wear contacts, please remove them before your appointment or bring contact solution and a contact lens case with you. Do not get your lashes wet or apply mascara for 24 hours. Do not apply any lash growth serum or castor oil for 48 hours. Also, sleep pretty (on your back!) for 24 hours after your service so no extra curling occurs. Absolutely! Check out the amazing facials we offer. With the exception of your immediate post-treatment care, there's no maintenance at all! You don't have to do anything special with your lashes in between lifts. Of course! After waiting 24 hours, you'll achieve an even more dramatic effect when mascara is applied to your curled lashes. HAVE YOU BEEN CERTIFIED IN THIS SERVICE? Yes! We are trained and certified in the Elleebana Lash Lift. Oh yes! Anyone with these types of pesky lashes will love the lash lift! Post treatment, your lashes will all be evenly dispersed and lifted. We will always end your service with a complimentary Keratin boost to help seal and condition your lashes.